የትግሬው ወያኔ እስካሁን ሲጫወትበት የነበረው የመጨረሻው ካርድ፡”እኛ ከሌለን ኢትዮጵያ ትበታተናለች፣ አብሮ መኖራችን ለግድያ ካበቃን ትግሬን እንገነጥላላን” ብለው ባለቀ ሰዓት በትግሬው ወያኔ ጋዘጠኛ ከመቀሌ በዳዊት ከበደ አጋፋሪነት፤ በዉጭ ደግሞ ደደቢቶች ባሠለጠኗቸው የትግረወ ወያኔ Facebook ሮች ሲያስተጋቡ፡ አብዛኛው ህዝብ እፉፉፉ ጥርግ በሎ ብቻ አገራችንን ኢትዮጵያንና ህዝቦችን ለቀቅ አድርጉልን አሏቸው። ከህዝቡ ይሄንን ሲሰሙ “ዘይትና ዉሃ ወይም እሳትና ጭድ ” እንዴት አንድ ላይ ሊቆሙ ቻሉ ብሎ የፎክረው ፌንጣ እና የትግረው ወያኔ ነገረ ፈጅ ጌታቸው ረዳ «እረ እኛ ምን በወጣን ፤ ከኢትዮጵያስ ተግንጥለን ምንስ ልንበላ፡…..?» የዘረፍነውነና በትግራይ ጎተራዎች የሞላናቸዉን እህሎች ለመብላት እኮ ኢትዮጵያ ታስፈልገናለች ፤ ያለ ኢትዮጵያማ ምን ልንበላ ኤርትራን ያዬ ተቀጣ እንዲሉ ብሎ “አንገነጠልም ” ብሎ ማስተባባዬ መሰል ነገር በ EBC ሲሰጥ አዬነው። ወይ መጨነቅ! ስለ ሻዕቢያ የተባለ አንድም ቃል ሳይኖር ምነው ስለ ሻዕቢያ ይህን ያህል አቶ «ሙሉጌታ አንዳርጌ»? ሰዎች!! ግመል በጣም በጣም በጣም ብልጥ እንስሳ ናት!!! ሻብያ ኣሰልጥኖ ለብዙ ክፋት ነገሮች ይጠቀምባቸዋል። ለምሳሌ፤ እንደ ኮንትሮባንድ ዕቃዎችን ማጓጓዝ፣ እንደ ትጥቅ መሳሪያዎችን በተፈለገው ቦታ ማድረስ፣ ያውም በኣንድ ሰው ብቻ በመመራት ይከናወን ነበር። ይህን በዓይኔ ኣይቼ፣ ታዝቤ፣ ግመል ምን ያህል ቅን፣ ታዛዥ፣ ብርቱና ቀልጣፋ እንሰሳ እንደሆነች ተመልክቻለሁ። ኢትዮጵያውያን ኣፋሮች፣ ስለ እኛ ኢትዮጵያዊነት፣ ግመሎቻችንም ሳይቀሩ፣ ባንዲራዋን ጭምር ጠንቅቀው ያውቃሉ፤ የሚል ኣባባል ኣላቸው። ቂቂቂቂ!!! እኛ የምናወራው፣ ስለ ዕኩልነት፣ ሻቢያና ኣቀንቃኞቿ የሚያወሩት፣ ስለግመሎቻቸው ሆነ!!! ገና ለገና ግመል ኣገልጋይ ነውና፣ የባቡር ሃዲዱን ሰልጥኖ ሲዘጋብን እያየን እንለፍ??? ቂቂቂቂ!! ኣፋሮች እኮ ብዙ ግመሎች ኣሏቸው!! እስላሞችም ናቸው። ባንዲራዋን ለብሰው፣ ሃዲዱ ላይ እንዲወዘቱ መፍቀድ ተገቢ ነው??? ወያኔ ኣንድም ቀን፣ ስለ ዕምነት ልዩነት ሰብካ ኣታውቅም!! ባይሆን ግመሎች እያወኩን ነው። እነሱም እስልምናን ተሰብከው ይሆን??? መቼም ክርስትናውን ማርቆስ ሰው ልኮልን ይሆናል!!! ቂቂቂቂ!!! ይህቺ በግ ከታረደች፣ ኣትበቃንም። ይልቅ ግመሏን እንረዳት!! TPLF is using this analysis to win the war on diplomacy by blaming OPDO. They have put one article infront of their diplomacy page an on top unusual. Some people say though anti TPLF, Mikael works with CIA or some EU intelligence or some organization They are using his analysis , which because it’s coming from opponent, makes it more credible for playing a religion card in their diplomacy. TPLF is cruel. They changed their strategy of diplomacy after reading the analysis by Mikael Arage. It’s the only card that’s working for them at the moment. HR.128 won’t pass because US gov is convinced by now that OPDO has been hostile to Christians. 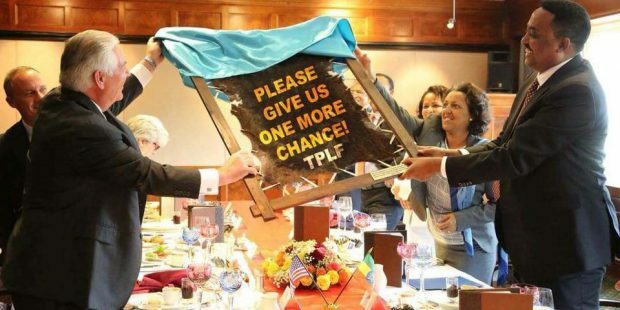 Though TPLF used reglion as a weapon of division, it’s using it now to win diplomacy. በዘር ሀረጋቸው ትግሬ ሆነው ኢትዮጵያዊ ስሜት ያላቸው ጥቂት ምሁራኖች ኣሉ። ለምሳሌ ዶ/ር ሀይሉ ኣርኣያ። ውያኔ ይሞታል እንጂ እንደነዚህ ኣይነት ስዎች ወደ ስልጣን ኣያመጣም። ዛሬ ስለረፈደ እንደነዚህ ኣይነትም ስዎች ቢያመጣ ከመሞት ኣይድንም።ነቀርሳ ይዞት መታከም በማይችልበት ደርጃ ላይ ያለ ስርኣት ነውና መድህን የለውም፤ ከሞት ሌላ።!!! ትግሉ ይቀጥላል!!! ወያኔን እሽሩሩ ማለት የለም፤ ቀብረን በመቃብራቸው ላይ እንዳይነሱ ድጅኖ እንቀረቅርበታልን። ሰላም ሁኑ!!! What really surprising me in life is how some people like our own ‘brothers’ from TPLF keep being wicked against their own Ethiopian family people only just for the sake of their own comfortable life. Based on this, how can we say them human? Actually, whether we accept it or not, behaviour of anyone can be based on the kind of the spirit that governs him, Holy Spirit or Evil Spirit. So, expecting good things from those who are governed by the Evil Spirit is like expecting Chicken from the egg of Snake.